Dozens of similar complaints cascaded on Reddit after tickets to Bernie Sanders’ October 29, 2017 health care talk at Convocation Hall sold out within seconds. Whether or not ticket bots — software that can quickly acquire large amounts of tickets online, most of which are usually later resold at a price significantly above face value — had a role in the Bernie Sanders event, the topic itself has received much attention over the last few months. On December 13, 2017, the Ticket Sales Act was passed in Ontario. The act formally banned ticket bots and implemented secondary measures to reduce reselling incentives. Additionally, Ticketmaster has made significant upgrades to its technology to fend off the bots. Will these measures really be enough to win the arms race against ticket bots? Scalping has always existed in some shape or form since ticketing has existed. However, it has reached new dimensions with the shift to selling tickets online. Experts estimate that the global scalping industry is currently worth $8 billion. It’s hard to believe this revenue was generated by scalpers sitting by their computers and buying their tickets one at a time. Rather, bots are snapping up huge amounts of tickets online by filling in the seller’s dropdown prompts in mere milliseconds. Many of these bots use a software called Optical Character Recognition — which is designed to recognize and input numbers and characters as a human does — to bypass CAPTCHA. CAPTCHA is the distorted text users must decode when purchasing tickets to verify that they are human. However, a lot of ticket bots’ success comes from the grunt work that is completed before the software is written. Many scalpers study the underlying architecture of the Ticketmaster website, research presale passwords, or enrol in presale-specific credit cards. This effort is rewarded by an ever-growing demand for tickets and resellers themselves. According to a recent CBC News article, StubHub, a ticket reselling website, offers attractive benefits to high-volume resellers, including “reducing its 10 per cent cut on each ticket sold” and providing “special software to upload and manage” large inventories of tickets. Given the inherent unfair nature of ticket bots, what is being done to undermine these efforts? Legal officials in Ontario have taken steps they believe will curtail the use of ticket bots, the most significant of which has been the Ticket Sales Act. The legislation caps resale prices at no more than 50 per cent above the original price. Essentially, the act seeks to not only outlaw ticket bots but to remove the incentive to use them in the first place. It also forces sellers to disclose the maximum event capacity, the distribution method of the tickets, and surcharges up front. Violators of this law could face jail sentences of up to two years and fines as high as $250,000 for corporations or $50,000 for individuals, according to a spokesperson from the Ministry of the Attorney General. The Ticket Sales Act was originally announced by Attorney General Yasir Naqvi in June 2017 in response to The Tragically Hip’s farewell hometown concert in Kingston selling out in minutes. Two thirds of the fans turned to online scalpers to get tickets, with fans paying hundreds or even thousands of dollars for a ticket originally priced at $50. It is estimated that resellers made between $25 million and $30 million in markups on the final tour of the iconic Canadian band. Critics of the legislation also believe the cap on resale prices is problematic. “If you don’t provide a platform for people to sell for more, they’ll simply go to underground sites, because there will still be a demand… there’s never going to be enough tickets,” said Catherine Moore, an adjunct professor of Music Technology & Digital Media at U of T.
Broadly, Canadians are unsure if the government should control ticket bots. 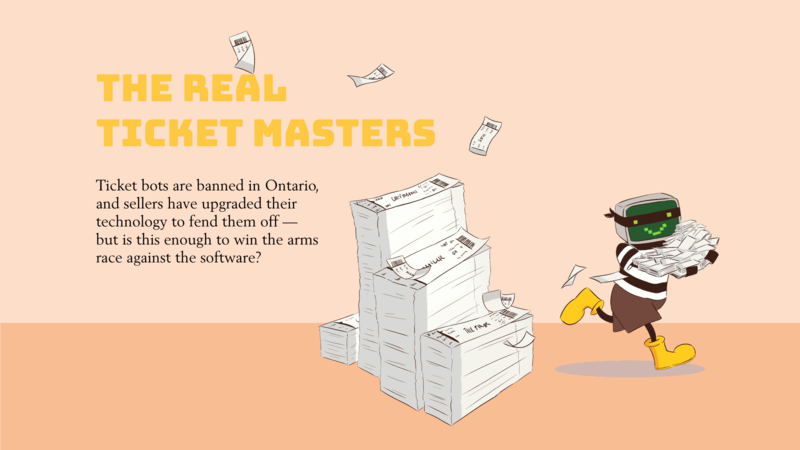 A recent poll published by the Angus Reid Institute illustrated that, although eight in 10 Canadians supported making ticket bots illegal, they were split down the middle on whether changing the ticket marketplace should be the responsibility of the government or the industry. If half of Canadians feel that the ticket bots should be handled by the industry, what have they done so far to reduce ticket bot attacks? It seems that there isn’t an industry standard: each seller has their own defence plan. Eventbrite uses an “algorithmic approach” that consists of weeding out scalpers in three stages: before the purchase is finalized, within a few minutes of completion of purchase before the tickets sell out, and after all tickets are sold, conducting a “paper scrape” in the days that follow. Scalpers have easily circumvented the latter two methods. In an interview with Vice, legendary scalper Ken Lowson stated that with multiple credit cards and multiple addresses — thus appearing to be several different people — a careful scalper can easily beat the over the limit sweeps. Paperless ticketing is also not an issue according to Lowson. Wiseguy, the scalping company run by Lowson before his arrest for wire fraud charges in 2010, would request its wholesalers to ask their clients for their credit card numbers, before entering the credit card numbers when paying, just like any other client. But Ticketmaster is evolving. Most recently, the company launched the Verified Fan program, where ticket buyers are screened to confirm their authenticity as fans of the artist prior to getting first dibs on tickets. In the case of ticket sales for Taylor Swift’s most recent tour, which used a version of the Verified Fan program, fans were measured as authentic by their participation in ‘boosting’ activities such as buying her new album, watching videos, and sharing links on social media. Nonetheless, given the sophistication of many scalpers, fans who spend a considerable amount of time boosting Swift may not even get tickets. In addition, there is also “dynamic pricing,” where ticket prices are not set but fluctuate according to demand. This was the approach used in ticket sales for the hit Broadway musical Hamilton, which was successful in reducing the price of tickets on reselling sites. However, doubt has been expressed as to whether this measure will translate into more tickets for the average fan. “[Ticketmaster] will simply BECOME the scalper, eliminating [the resellers] from the mix,” wrote Nine Inch Nails frontman Trent Reznor on the band’s messaging board. In between bots, legislation, and a reduced number of tickets available to the public, typical concert-goers like students looking to decompress after midterms or fulfill their long-held wishes to see their dream band in the flesh will have to shell out more money than ever to do that. This makes listening to your favorite music live a luxury.